The Henckels International Fine Edge Pro series is one of that company's lower quality product lines, and even though Henckels still backs it up with their excellent warranty, with this 7 piece block set you won't get the features that make Henckels popular. The Fine Edge Pro line is stamped steel construction and made in China (with German alloy steel). Better products made in a similar style are available from Forschner Cutlery by Victorinox. If a bargain offer does tempt you, be aware of what you're getting. If you expect the strength of Henckels forged knives you'll be disappointed. The blades of these knives are thin and flexible and will need frequent honing. The utility knife does not have the fine edge the name of the set implies, and although serrations do help in some situations such as cutting through hard crusted bread, this sort of edge isn't necessary for slicing tomatoes as some suggest. The grade of steel used in this set dulls quickly, and a serrated edge must be resharpened at the factory. The 7 inch hollow ground santoku is not up to average standards. For the hollow ground graton blade to work as expected, breaking the contact between sliced food and blade and limiting the amount that rolls away from the cutting board, the hollows need to be more than superficial. On this blade they are shallow and widely spaced, more decorative than functional. Paring knife, chef's knife, kitchen shears and a sharpening steel round out the tool set. 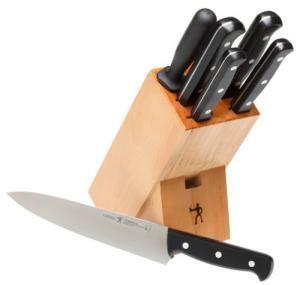 The seventh piece is a small hardwood block knife holder mounted on shallow rubber feet that keep the holder in place and above any dampness on the counter top.